The food is very good and the staff excellent. The food was very good, and the service beyond compare! Very good restaurant! Cozy atmosphere, very nice ???????????? good foodand the stuff it's very friendly ! Recommend ???? I am stunned and bewildered that this is a 1 star Michelin restaurant. The beef tartare, while generous in proportion, possesses zero flavour. The 30 euro foie gras terrine was a tiny sliver of mediocrity on a plate. The Milanese risotto came to table with a thick skin suggested it has been under warming lights for some time. The staff, while polite, lacked the polish and experience one expects at this level of establishment. The waiter removed a 20 Euro glass of Chardonnay from the table with a quarter of the glass yet to be drank. Great food , better service. Overall a wonderful experience. The top Italian restaurant in Milan, and I have been to a lot. Very nice "The Godfather" style and great quality of all the food. Dishes are traditionals in Milan but with a very high quality touch of innovation. A MUST for food lovers, and for those looking to taste Milan gastronomy. As a high quality restaurant, prices will round 50-60€/person that I loved to pay. Very nice ambiance and unique decor, you like it or not, we did. Food was excellent,from the beginning to the end, especially the foie gras and the scallops. 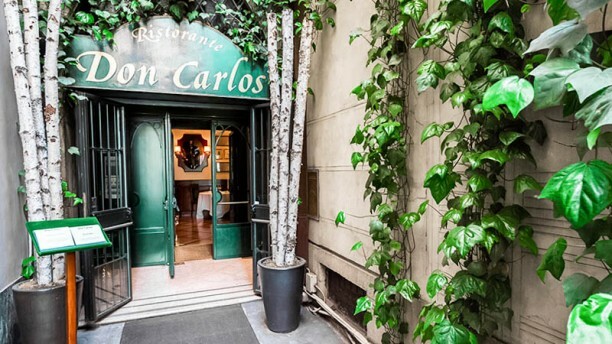 Intimate restaurant decorated with pictures of opera composers, singers and stage designs. Well-chosen and not trivial classical background music. Delightful service by two young women. When in Milan, Ossobucco and Risotto are a must and are well served here. Portions left nothing to be desired and bill very reasonable in the circumstances. Waitress too persuasive. Food and atmosphere not bad. A bit overpriced.